Our marketing wiz moves on and we embrace the addition of snow to our winter. A couple of dry months have given way to some much-needed snowstorms here in Paonia, Colorado. While the snowpack is still short of normal, we’re happy to see it trending in the right direction. This has gladdened the hearts of farmers and ranchers and allowed for something of a ski season for staff and writers at High Country News. HCN correspondent Sarah Tory and our associate photo editor, Brooke Warren, put the new snow to the test by competing in the Gothic Mountain Tour, a 22-mile ski traverse in nearby Crested Butte, both finishing in the top 10 for women racers. Late February brought some familiar faces to the office. Dave Linden, a subscriber from Durango, Colorado, spoiled us with some tasty cookies that didn’t last long. Other visitors included Steve Hinchman and his wife, Debbie Weis. Steve was an intern with HCN in 1986 and continued working with the magazine until 1994. He recalled some of the more laborious tasks, like clipping newspapers for hours and packing and shipping the magazine. Steve and Debbie now live in Maine, but said that coming to the Western Slope always feels like coming back home. For what it’s worth, Steve, interns these days spend much more time writing for the magazine than shipping it. Thank you for the reminder! This month, we’re saying good-bye to one of our dearest staff members, JoAnn Kalenak. 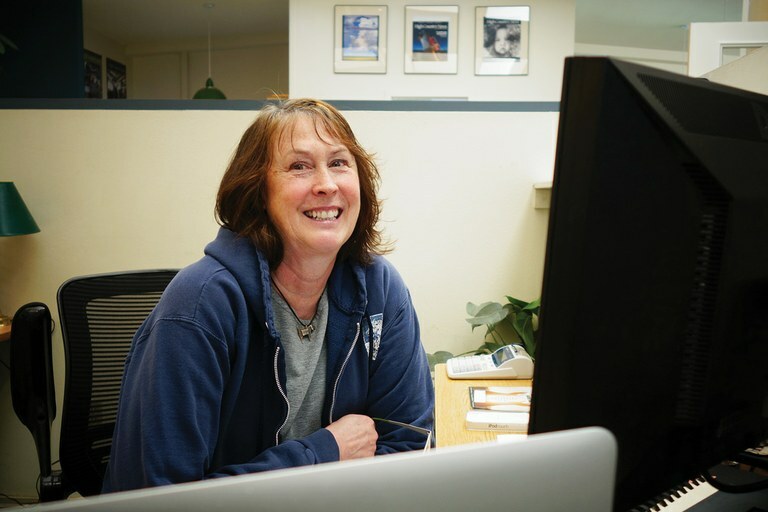 JoAnn started working at High Country News in 2002 with the production team and has become one of our most valuable assets, as marketing and promotions manager. She has been instrumental in helping us reach our subscription goals and in spreading the word about the magazine. Last month, we saw one of our highest circulation numbers ever, more than 35,000 and climbing, due in no small part to JoAnn’s work. JoAnn Kalenak, during one of the last days at her desk. She has filled many crucial roles for the organization over the past 15 years. “This has been the best place I’ve ever worked, there’s no doubt,” she said. “The readers are so dang smart, you can’t get away with anything.” Joking aside, she said, “It’s been an honor to work for High Country News. We’re small, but elegantly impactful, and I love being impactful.” JoAnn will continue to work for HCN as a consultant, helping us find new readers across the country. She’ll also be on the lookout for professors and other educators who want to sign up for free classroom subscriptions through our HCNU program. On a final note, thanks to support from our readers, HCN was able to raise over $26,000 through a Kickstarter campaign to launch a new series called “A Civil Conversation.” In it, HCN board member (and promising journalist) Wayne Hare will spend the next six months documenting the history and modern experiences of African Americans across the West. Next stop: Portland, Oregon!